In many ways it is the local council level of government which has the most profound impact on our built environment. In most cases they are the first line of decision making for buildings seeking planning approval and they also have a very significant role to play in the formation of local planning strategies and regulations. Right now the 79 local governments across Victoria are in election mode, with the postal ballots being accepted until Friday 21 October. 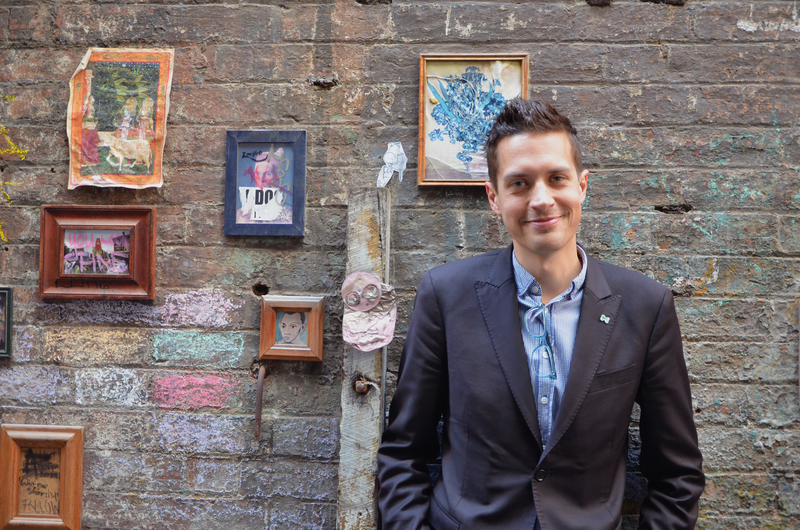 In this election special, The Red+Black Architect spoke exclusively with Councilor Rohan Leppert from the Melbourne City Council. Rohan is one of very few councilors across the state with any formal training in planning or architecture. Red+Black Architect – You’re currently studying a masters of urban planning and environment. How has this influenced your decision making process when considering planning applications? Cr Rohan Leppert – It’s a really good question. I’m only half way through the degree which is quite theoretical and I’ve not had to do too much technical work yet. To be perfectly honest, the work I’ve been doing at council has been influencing my work in uni much more so than the other way round. It’s good, I appreciate having a much more solid understanding of the history of planning in Victoria to when I’m applying my role as a decision maker on planning applications and planning scheme amendments at the city of Melbourne. In many ways, I think it improves the quality of my work at the city of Melbourne. I’m in a very fortunate position. R+BA – From what you’ve seen of how the council operates and the various councillors, how they vote and questions they ask. Do you think that the other councillors have a genuine understanding of what they’re deciding upon or it is very much a case that they’re relying on their officers to sort of hold their hands through the process? Cr RL – Well there are eleven councillors and I think it’s fair to say there are eleven different understandings of the role of a councillor. That’s natural and inevitable. Well before I went back to do more study in this area, I’ve been on the public record being quite critical of the lack of training available to councillors at the beginning of a term. Because roughly half of all matters considered by council are technical planning matters and none of us have any training whatsoever upfront. I think that’s inadequate for somewhere like the city Melbourne, which is growing at break neck speeds at the moment and which has one of the most complicated sets of different planning controls across different areas of most councils. I also think it’s too easy for councillors to throw their hands up in the air and say that their role isn’t to judge the quality of planning applications. It’s either to say, we’re not qualified, therefore we must always vote the way offices tells us to. The logical extension that argument is why get elected in the first place. Or in the worst cases, and there is maybe a couple of councillors on this council that do this, they believe their role is to vote based on the quantity of objections and so it’s gut feeling whether they like it or not. It’s a gut feeling whether there is community opposition to an application or not but as we know that’s not the way planning rules work. The council is meant to take a much more legally pure approach and decide whether or not an application complies with the scheme. Not decide whether or not the application complies with their gut feeling. This is a problem for all councillors at all times but we often have quite a few messy debates at the city of Melbourne because we all have different understanding of what our role is. Of course I would say this, but I believe I have a much more correct understanding of what our role is than others do, but all councillors will say that! R+BA – How would you rate the Melbourne City Council’s performance over the term? Cr RL – What we’ve done this term is automatically consider all ministerial applications for towers above twenty-five thousand square meters in floor area. That has changed the quality of the public debate around what constitutes good planning in the central city. It has forced the minister’s hand on quite a few occasions and it’s pressured the minister to be more publicly accountable for the decisions that he makes. Whether that was Matthew Guy or now Richard Wynne. The council has definitely this term improved the quality of debate around central city planning and that alone deserves a tick I think. The other side of that same issue is the fact that, because we consider so many large applications in public, I think this council is very bad at switching over to considering small applications in ResCode areas for example. Far too often I think some of our councillors particularly those who might not live inside the municipality – and we’re unique in being the only council Australia where a majority of councillors don’t live in the municipality – don’t know how to deal with issues surrounding smaller residential zone applications. So a bit of mixed report card from me. We’ve improved the quality of debate around ministerial applications but we still make a mess far too often of the residential design applications. R+BA – Perhaps the most contentious CBD shaping projects of the Melbourne city council at the moment is the redevelopment of the Queen Victoria Market. What is your take on what has been proposed and the process to get to the proposal? Cr RL – There are lot of aspects of the Queen Victoria Market renewal that I strongly support including upgrading the car park to a new central city park for tens and thousands of new residents to enjoy. We need hot running water and a refurbishment of the bathrooms and the public amenities and the pedestrian areas and just the streetscapes generally to the Queen Victoria Market. All of these things are important, overdue, excellent things to do. There is still a very valid public debate over the extent which underground services are needed and council needs to do much more work to demonstrate what that need is. There is more work to be done on being transparent about what the global budget for the whole renewal program is and what its component parts are going to be spent on. The biggest thing, I’ll certainly be continuing to advocate strongly for, is to improve the governance of the Queen Victoria Market, which is now quite outdated. The constitution which is a couple of decades old now, has one remit for the board and management and that is to drive a profit and return it to council. Now, the markets are a lot more than that and the management of the market now really answerable to both the board and the council in a way because the council is leading the renewal and that’s forcing the boards hand on a lot of its operational decisions because they have to anticipate that renewal. I think it’s time for a governance overhaul of the Queen Victoria Market and that’s going to be important now during the renewal, not afterwards, because the governance structures are very out of date and probably aren’t serving the market and the people of Melbourne as best they could. R+BA – Do you think there is enough support of the existing businesses to continue to operate during this sort of uncertainty or down the track when there is construction work to make sure that the long serving businesses survive the disruption. Cr RL – Well I absolutely don’t think that there was enough but last month at council, I moved a motion to establish a compensation fund for all traders. All traders who aren’t on perpetual licenses have now been given a five year certainty through the life of the renewal to know that they will be trading throughout, but what they hadn’t been given was an insurance that they won’t be worse off if they take that five year license. I’ve established a compensation fund by forgoing the license fees that come from Queen Victoria Management to the council which I want to be passed on as fee relief to the traders. Any trader who can demonstrate that they’re worse off as a result of the renewal, we will make a proportional cut of their license fees. I think that’s only fair because what is happening here is going to be very disruptive. The end result is promised to be a vast improvement and I’m going to work very hard to make sure that is the case. In the meantime, we have to be scrupulously fair and supportive of the traders who are the lifeblood of the market and have been for generations. R+BA – What are your thoughts on the state government’s draft apartment standards? Cr RL – We considered this at council recently as well. Look, it’s a strange one. The apartment guidelines have been such a long time coming and obviously Mathew Guy went through a couple of rounds of work on this and then there was a big pause with the change of government and then it was promised to come back soon. In one sense, these are years too late. In another sense, what’s been released now seems to be quite rushed and incomplete. I’m quite critical that the draft standards have been released but the draft objectives haven’t been released alongside them. If we’re looking at a performance based regime, a ResCode style regime for apartment standards, then the state government should be consulting on that comprehensively. It’s all very well to say here are the draft standards but if you don’t know what the objectives are then you don’t have the complete picture. There are also quite a few issues that I know are going to be picked up in this consultation round. For example the standards about the dimensions of rooms may be causing knock-on issues. This has all been in the public realm. I’m very nervous about what we’re going to be saying with more and more tiny living areas because there are no standards around minimum dimensions and sizes for living areas but there are around bedrooms. While the bedrooms might be getting a higher quality, are the living rooms going to become lower quality? All of these issues need to be properly tested and to be frank, we’re a long way from something that I’m confident will be improving the quality of apartments in Melbourne. R+BA – Wouldn’t that be the role of a draft document, to have that discussion early rather than to lump it together as the final release? Cr RL – That’s right but my understanding is that the final is going to be released in conjunction with the final central city built form review controls. That suggests to me that the complete apartment guidelines planning controls won’t be consulted on. We’re just looking at the early draft standards only now and it may be that there is no consultation on the complete picture before they’re gazetted in December. I don’t know the answer to that question but there is still a little way to go. R+BA – What project or precinct do you consider to be the most vital to get right for Melbourne’s future? Or to put it in another way, in hypothetical question. If you can instantly fix one precinct or build one piece of infrastructure for Melbourne, what would it be? Cr RL – I’m strong supporter of the Metro and I think that’s going to be a complete game changer for transport in Melbourne but that’s a very standard answer that you’re going to hear from many people. If I could wave my magic ward, I would go back in time and stop Matthew Guy from rezoning all of Fishermans Bend to capital city zone overnight. We’ve now got a Labor government who have inherited that problem and has pretty much decided that it’s too complicated and too great an infringement on property rights to reverse that decision now. We’re in this ludicrous space where they’ve released a draft vision framework for Fishermans Bend which talks about what land uses they want in each of these precincts, but they know full well that they have a capital city zone which allows most land uses as of right. So they’re looking at financial incentives to encourage apartments in some areas but not others, offices in some areas but not others, artist live-work spaces in some areas but not others. We’re now looking at a situation in Victoria where we’re ‘post–zoning’ in terms of how we’re going to be generating and incentivizing land use. That’s quite dangerous. It’s relinquishing government’s role in regulating good public outcomes and it’s embracing this very unpredictable, very neo-liberal space which I’m utterly nervous about. I think that the Labor government is not averting the disaster in Fishermans Bend that Mathew Guy created and that’s very scary. R+BA – What’s on your agenda if you’re re-elected for another term? Cr RL – A lot of things. We released a twenty-six page policy platform. It’s always the way that the Greens are very policy heavy in the context of elections. I would like to refocus council attention on the affordability crisis in housing in the central city. As you may know the offices have worked for years and years preparing a housing strategy for the city of Melbourne which at five minutes to midnight, a majority of council decided they did not want to include any planning controls for affordable housing quotas in urban renewal areas. That was devastating. It means that after all of that work, council does not have a policy on how it is going to drive affordability in urban renewal areas or anywhere in the city other than a few individual sites that it happens to own. Council squibbed it and the planning minister also squibbed it. He went with an election promise of introducing inclusionary zoning in some areas, we’ve heard nothing more of that in two years now. The council and state government must start addressing this issue. I know it’s very much a state government issue as well and state government needs to build more public housing, it needs to introduce more planning controls to force a higher quality apartments and more affordable apartments. Council can play leading role on that as well and it completely squandered that role in this term and we need a bit more of a shift and the balance of votes on council to be perfectly honest to make a different in the next term. Housing affordability is a huge emphasis for me going forward. R+BA – What is your view of developer donations to candidates? Would outlawing this practice, banning developer contributions, will that push it underground in the sense that it will be invisible to scrutiny . For example, many developers are sort of the ‘mom and the dad’ kind of developers who are not huge players in town, but they do projects all the same. They are somewhat anonymous and so if they donate via their personal name, how would you know if they’re a developer or not? Cr RL – That’s absolutely right. I believe that developer donations are a form of soft corruption at least and must be abolished but how you define ‘developer’ is the crux of the matter. In New South Wales where donations from developers have been banned, there has not been enough work been done to be define in the legislation what that actually means. Luckily though in New South Wales they’ve got ICAC which is a strong anti-corruption body which can weed out the behind-the-scenes, getting-around-the-law activities that have gone on in that state. For example in Victoria, if we were to introduce the New South Wales model of banning developer donations, I don’t think our IBAC is strong enough to do what ICAC does. You can’t just copy what they have done in New South Wales. We need a very strong definition around which class of persons and organizations may not make a donation, and mechanisms to stop the transfer funds via a third party as well. However the principle is absolutely the right one. That councils which deal so often in making assessments of whether or not development should go ahead, must not ever be influenced. The constituent members, the councillors, must not ever be influenced by donations from developers. It just makes the work of council grind to a halt if we lose quorum as we’ve done at this term of council here. Just as badly, the perception in the public that council cannot act in the public interest is utterly, utterly damaging and it loses all the good will that there might be for council to plan new planning rules and to plan new communities. It just puts this big question mark over everything we do and that’s just so lamentable. Especially for those of us who have vowed to never ever, ever take a donation from any developer, and of course the Greens never will. R+BA – Recently Sydney had their local council elections and there was a bit of controversy around the state government introducing new rules around how businesses could vote and so forth. Despite all that, the siting Mayor, Clover Moore was re-elected by an even stronger margin. Is there any lessons to be learnt from that context or is Melbourne in completely different bubble? Cr RL – There are similarities but there are quite a few differences as well. The law change in Sydney recently was just about compulsorily enrolling businesses and giving them all two votes. That was the only bit of the legislation. It was much easier to galvanize opposition around because it was quite clear that that legislation was introduced for one reason only, and that was to knock off the incumbent Lord Mayor. In Melbourne, we’ve got this system in place already but it came into effect as part of an omnibus package with the 2001 City of Melbourne Act introduced by the Labor Government. Jeff Kennett introduced two votes for businesses in the 1990s but it wasn’t until the omnibus City of Melbourne Act in 2001 was introduced that the sweeping changes in all aspects of City of Melbourne Elections were introduced. There wasn’t the opportunity there for the public to galvanize around those changes because they were part of a more comprehensive suite of changes and it also wasn’t about getting rid of an incumbent because immediately before the act was introduced we’d had administrators at the City of Melbourne. Of course all local residents are always happy to get rid of the administrators! There hasn’t ever been the outrage in Melbourne that there has been in Sydney and yet our electoral system is much worse. Non-residents make up sixty percent of the residential role here whereas in Sydney, the residential role is still the vast majority of the role. Because of that set of circumstances we’ve never had the public outrage that we’ve seen in Sydney recently. Which is a shame because the Melbourne electoral system is fundamentally a system that enfranchises money, it’s the most male electoral roll in the country, it’s the most wealthy electoral roll in the country and as I said earlier, it’s the only council in the country where majority of the councillors live outside the municipality. Now all of these things really deflect the purpose of local government I think. It removes council from the day to day work of the community to too great an extent. It’s a strange situation. We’ve got a much worse situation than Sydney does at the moment and yet we’ve got less of the outrage because of the particular ways that both systems were formed. That’s the system we all have to work in. R+BA – Thank you very much for your time. Voting for local council elections close on Friday 21 October 2016, make sure you have your say. This entry was posted in all posts, construction industry, Government Policy, Interviews, News, Urban Design and tagged Apartment Design Standards, apartment quality, CR Rohan Leppert, Fisherman’s Bend, Melbourne, Melbourne City Council, Melbourne Metro Rail Tunnel, Queen Victoria Market, Rohan Leppert. Bookmark the permalink.